FOLSOM, CA--(Marketwired - Apr 6, 2017) - AgreeYa Solutions -- a global provider of software, solutions and services for public sector organizations -- announced that it will exhibit at the upcoming California County Information Services Directors Association (CCISDA) Spring Conference, which will be held at the Resort at Squaw Creek in Olympic Valley, Calif., from April 9 to April 12, 2017. CCISDA, the official organization of county information technology directors and chief information officers in the state of California, represents all of California's 58 counties in the area of local government information technology. An esteemed technology partner with an aim of "Empowering Digital Government," AgreeYa is pleased to have been selected to showcase its suite of software, solutions and services at booth 135 for the duration of the conference. "Government systems have one of the most crucial needs for efficient, reliable software," said Ajay Kaul, managing partner of AgreeYa Solutions. "With advancements in technology and increased citizen expectations, governments stand ready to adopt next-level systems, and we are proud to offer the services and solutions that will help county leaders better serve their communities." With more than 18 years of industry experience, AgreeYa has built a strong reputation by providing software, solutions and services to local, state and federal public sector organizations. 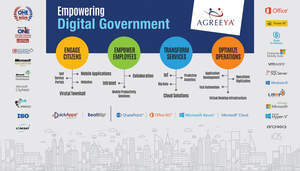 As more state and local governments rethink the use of technology to streamline services, improve access to public information, provide government transparency, reduce lengthy application development processes and promote inter-agency data integration, AgreeYa is quickly emerging as a leading choice. With AgreeYa's innovative software, solutions and services, local governments are able to transform their operations and infrastructures, engage citizens and businesses and accelerate economic development and environmental sustainability. With two conferences per year -- one in the fall and one in the spring -- CCISDA is widely attended by CIOs, GISOs, ISOs, network managers and other top level management professionals representing county IT in California. The conferences not only promote collaboration among peers and educational opportunities through sessions, keynote speakers and roundtables, but they also offer vendors the opportunity to connect with an audience of top-level county IT decision-makers. For more information about the conference, click here. For more information about AgreeYa and its wide array of solutions, click here. About AgreeYa Solutions: AgreeYa is a global provider of software, solutions, and services focused on deploying business-driven, technology-enabled solutions that create next-generation competitive advantages for customers. Headquartered in Folsom, Calif., AgreeYa employs more than 1,500 professionals across its 20 offices in eight countries. Over the last 18 years, AgreeYa has worked with 200+ organizations ranging from public sector, Fortune 100 firms to small and large businesses across industries. AgreeYa's software portfolio includes QuickApps (award-winning suite of SharePoint/Office 365 apps to customize SharePoint without coding), BeatBlip (simplified test automation solution), SocialXtend (intranet and enterprise social collaboration), VDIXtend (desktop-on-cloud) and Cogent (comprehensive end-to-end case management solution for collections agencies and law firms). As part of its solutions and services offerings, AgreeYa provides portal, content management and collaboration on SharePoint/O365; cloud and infrastructure; enterprise mobility; business intelligence and big data analytics; product engineering; application development and management; independent software testing; Anti Money Laundering (AML)/Risk & Compliance and IT staffing. For more information, visit www.agreeya.com.